Heed not the belligerent, bearded, bellicose bagpipe. 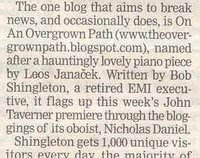 On an Overgrown Path, like many other blogs - unlike the Guardian, Independent, Times, Telegraph, FT, and the New York Times - offers serious classical music debate almost every day of the week. Besides - Lebrecht and his cronies should wake up to the fact that the blogosphere is increasingly appealing to those whose minds are still able and willing to wander outside the proscribed constraints of the commercially impoverished media industry. Back in your box Norman! It is worth highlighting that Guthry Trojan who contributed the comment above also pointed out in April that Norman Lebrecht was wrong twice over. As well the Minnesota cycle the Swedish Chamber Orchestra has also recently completed a Beethoven symphony cycle for the Simax label conducted by Thomas Dausgaard. At the center of this little storm in the blogosphere is the BBC’s Choral Evensong broadcast. Changes to BBC Radio 3’s schedules have already been mentioned here, but an important change to Choral Evensong has not. The daily broadcast of Choral Evensong is being moved from its Wednesday slot to Sunday. This may seem like ‘unchecked trivia’ to quote Norman Lebrecht, but it has quite an important impact for the many churches and cathedrals that perform the broadcast services. Sunday is a difficult day to schedule a broadcast in a church due to the other service commitments, whereas Wednesday fits very well. For more on these changes follow this link. Let's not forget the 2003 classic: "the year 2004 will be the last for the classical record industry." 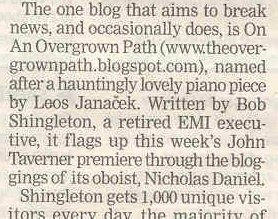 A row has broken out between Bob Shingleton, the author of the UK music blog On An Overgrown Path, and Norman Lebrecht, the author of the 1997 tract Who Killed Classical Music? Lebrecht, in a column on classical blogging, chides Shingleton for spreading "unchecked trivia" in a post about a choral broadcast on the BBC, and declares that the "nutritional value" of classical blogs is "lower than a bag of crisps." Shingleton defends his account of the BBC imbroglio, pointing out the delicious, Kettle Chips-worthy irony inherent in the spectacle of Lebrecht attacking other writers for getting facts wrong. In this very column, Shingleton notes, the British sage confuses John Tavener (b. 1944) with John Taverner (d. 1545). I wonder what Henry Fogel might have to say about the claim that he was once hired to "abolish London orchestras." Missed that one. Complaints about 'unchecked trivia'? From the pages of the Standard?! Lebrecht is an odd one. Some of his writings are insightful and perceptive, whilst others, in the case of the offending article, are pompous, snide and intellectually juvenile claptrap. He really must be threatened by high quality blogs like this one to have written such a spurious and lame article. He must in some way feel threatened, I meant to say. 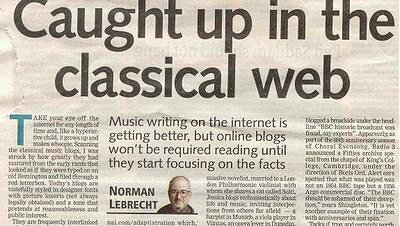 The egregious Norman Lebrecht holds forth on classical music blogs in a piece in La Scena and the Evening Standard; unfortunately he aims some unwarranted accusations at the excellent On an Overgrown Path, who replies robustly. One of the best blogs around is "On An Overgrown Path". Hands down. So how sweet it is to read this. Norman Lebrecht says bloggers don't check facts, particularly criticising Pliable's lack of FactChecking. Lebrecht calls Henry Fogel "a suit once hired by the Arts Council to abolish London orchestras." Gert says "Oops". You know, sometimes people like Pliable/Bob and Henry Fogel talk the talk because they know stuff having walked the walk. I suspect the concept of 'knowing stuff' is becoming increasingly alien to too many journalists. Either they google, or they opine, or they extemporise. Yet an average reader would more likely expect a supposedly professional newspaper to be more accurate than blogs by people who are amateur writers, albeit about their own professional sphere. How embarrassing to write factually inaccurate statements about people who don't check their facts. the delicious blog and the Lebrecht business, too! What an Ars(e) Musica he is! I'm assuming he means Cura, LICITRA, FLÓREZ, and VILLAZON? Dear oh dear. As your Arts Editor, shouldn't he have been able to get the names of these gentlemen right? Especially since both Juan Diego Flórez and Rolando Villazon have sung at Covent Garden in the last two years - Villazon less than a month ago in Les Contes d'Hoffmann. Needless to say, it was not published. I sometimes wonder if Norman Lebrecht actually goes to operas or even reads much about them, despite his frequent pronouncements on the art form's imminent death. In 'Novel ways to update opera' 7 July 2004, he writes: "There is an inner music to Greene, which makes the failure of his only opera [Our Man in Havanna] the more perplexing." His only opera? The End of the Affair based on Graham Greene's novel had its world premiere in Houston this year, to wide international press coverage, with two of the principle roles created by English National Opera regulars Cheryl Barker, Peter Coleman-Wright. Official newspaper circulation figures published today show that the Evening Standard suffered by far the biggest circulation drop of any of the major UK newspapers. Norman Lebrecht is Assistant Editor of the Standard as well as features writer, and in the period September 2005 to September 2006 the readership of the paper plunged by a whopping 14.4% compared with decreases of 4.6% and 3.6% for the Guardian and Independent respectively. Last week Lebrecht accused On An Overgrown Path of having a 'bug' about the BBC. devotes 936 words to ..... the BBC. At least we agree on one thing. On Sunday Nov 12 On An Overgrown Path sung the praises of Catherine Bott's new CD Convivencia. On Thursday Nov 17 Lebrecht's CD of the week was ..... Convivencia. Lebrecht reality check moment: "The average age in U.S. podia, Cleveland apart, is pushing 70" (Nov. 21). Michael Tilson Thomas is 51. That gives an average age of 56. I think if you factored in other orchestras the average age would drop. As an ex-Evening Standard music critic (given marching orders without recompense a year ago) who now finds himself more or less surplus to the profession's requirements (thank goodness for lodgers), I read all these comments about Lebrecht with a mixture of wry amusement and relief. If only controversialism were not so easily bought and sold.